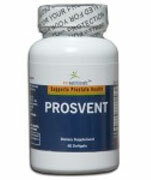 Prosvent is the natural solution for effective prostate health. It contains a comprehensive nutritional formula that designed to support a healthy prostate and urinary functions. For men that have to make frequent trips to the bathroom and hav to constantly get up at night, Prosvent can help. Prosvent is a natural, safe, and affordable alternative to the expensive prescription medication with potential side effects. The formula in Prosvent contains only all-natural ingredients, which includes saw palmetto extract, lycopene, nettle root extract, black pepper extract, and pumpkin seed oil, along with vitamins and minerals. The natural ingredients have be proven to support prostate health and reduce the symptoms of an enlarged prostate. These ingredients will help safely and effectively increase urine flow and reduce the symptoms of an enlarged prostate, including frequent urination, especially overnight. Plus there no negative side effects that comes with so many drugs. Right now with this special offer you can try 2 bottles of Prosvent, a 60 day supply, for just $1 plus shipping and handling.